With the popularity of barbell training, it’s easy to forget that you can get strong and lean without one. As a matter of fact, no squat racks, barbells or bumper plates are needed to get a great workout. A tiny apartment, office, hotel room or equipment-lacking gym combined with some MacGyver-style programming can yield serious muscle growth. Follow this three-day-a-week program that’s designed specifically for a tiny gym. You’ll need: dumbbells that go up to 40 pounds, a Smith machine, a flat bench, and a stability ball. Trust us: You’ll never look at your gym the same way again. Lower one dumbbell in front of you by bending at your hips and slightly bending your knees (like a Romanian deadlift). Then, rapidly extend your hips, knees, and ankles with a jump while pulling the dumbbell overhead. As you pull, keep your elbow above the dumbbell and keep the dumbbell close to your body. Catch the dumbbell wth arm extended overhead at the same time your heels hit the ground. From the top, use both hands to lower the weight. Repeat. Stand facing away from a bench and rest one foot behind you on the bench. 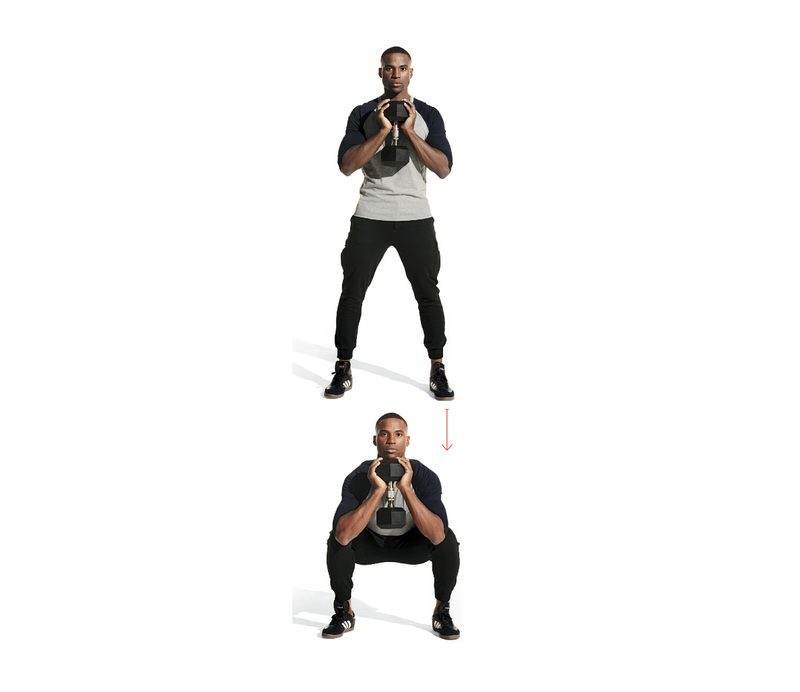 Squat down with the forward leg and keep that shin vertical. Perform a regular pushup with your feet on the bench. Keep your elbows close to your ribcage as you move. Grasp a barbell from underneath with hands shoulder-width apart. Squeeze your shoulder blades together, pull yourself up, and touch your chest to the bar. Grab a light dumbbell in each hand, lie facedown on a bench, and hold your arms straight overhead in a “Y” position. Start by squeezing your shoulder blades together and pull your arms up. Do not extend your lower back. Get into a plank position on a stability ball. While keeping your torso still, move your forearms in a circle. Then, switch directions. Squeeze your shoulder blades together and don’t let your lower back sage. Grab the end of one dumbbell in both hands and hold it by your chest with your elbows underneath. Stand with feet shoulder-width apart, toes pointed slightly out. Sit hips backwards while spreading knees apart. Descend below parallel while keeping your lower back flat. At the bottom, drive through your heels come up halfway, return to the bottom, and come all the way up. Get into a pike position — arms straight and legs straight with your hips high in the air — with your feet on a bench or small box. Slowly lower yourself and drive back up. Get into a pushup position with your hands on a stability ball. Keep your body straight from head-to-toe and don’t let your lower back sag. To make this harder, start moving the ball in random directions. Grab a dumbbell in each hand and curl the weighs up without swinging your body. 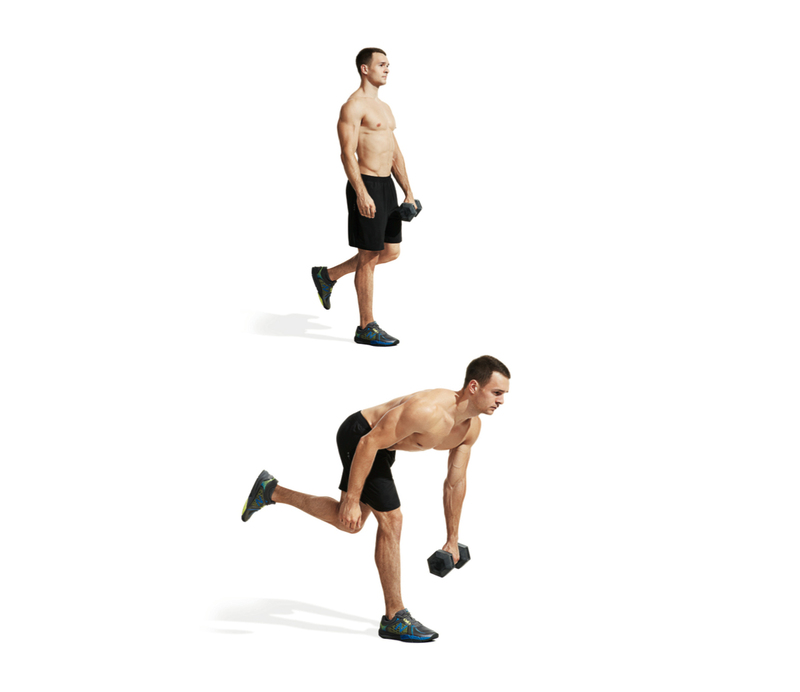 With dumbbells in your hand, slowly bend forward and pull one leg behind. Once the weights are below your knees, drive back up and squeeze with your glute. Don’t twist your hips to the side – keep them square and faced forward. Grab two dumbbells and hold them by your shoulders. Keep your core tight and glutes squeezed and push the dumbbells directly overhead. At the top, your biceps should be next to your ears. Don’t lean back or arch your lower back. Facing parallel to a bench, place your right hand and right knee on the bench, getting your torso parallel to the ground. Grab a dumbbell with your left hand, squeeze your shoulder blades, and row. From the top, let the dumbbell go halfway down, row again, and let the dumbbell return to the bottom. Grasp the Smith Machine bar from underneath with hands wider than shoulder-width apart. Squeeze your shoulder blades together, pull yourself up, and touch your chest to the bar. Start on all fours, with your shoulders directly above your hands, your hips above your knees, and your knees an inch above the ground. Crawl forward by taking a tiny step with your right arm and left leg at the same time, and then another step with your left arm and right leg. Alternate while keeping your hips low and your head up. To increase the difficulty, crawl backwards or laterally.